The past months we have worked hard on a new project we want to share with you. 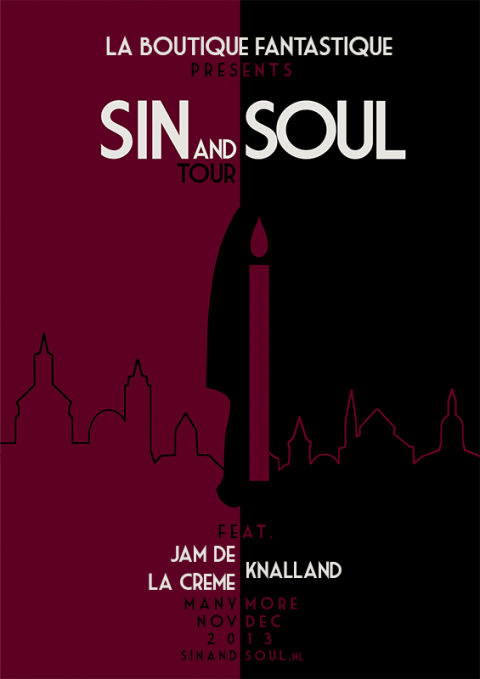 We are really proud to present the Sin and Soul Tour: a series of eight full evening concerts in churches through the Netherlands featuring Knalland, Jam de la Crème, and many, many more. For this unique project artists are inspired by the overwhelming acoustics and atmosphere of the churches they will play in, and by each other’s work. A daring adventure between classical and pop music, loving and raw, grand and intimate: between Sin and Soul. More than thirty musicians from the pop, jazz, folk, hip hop and classical music scenes will contribute to the Sin and Soul Tour. These include, among others, la Boutique Fantastique, Tommy Ebben, Sofie Letitre, Kim Janssen and members of The Kyteman Orchestra, Shaking Godspeed and Oh, Brave Wide Eyes. In addition you can rest assured that Jam de la Crème will bring along the crème de la crème of the Dutch music scene. Each concert consists of a set by la Boutique Fantastique and alternatively Knalland and Jam de la Crème. There will also be performances by various special guests. Check the www.sinandsoul.nl webpage and the Sin and Soul Facebook page regularly for new names and special guests. Tickets are on sale now, please check the Sin and Soul website for dates and tickets.